Starting with the Media Resource Centre’s Silent Remasters program in late 2009, Supermarket put Robert Wiene’s expressionist thriller from 1919 under the knife. 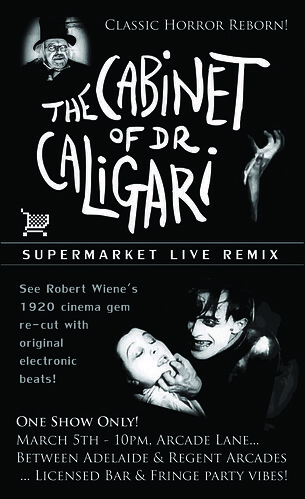 The film’s visual re-edit is accompanied by a fresh electronic score, and involves live performance elements and a live remixing of the work. Kindly assisted by the Niagra Artists’ Centre (Ontario, Canada) the work was previewed in Adelaide, before premiering in Perth at Kinetic Carnival, in April 2010. The performance is available for further performances on enquiry, and a limited edition preview DVD is available on request.